Hanging your herb garden opens a new world of space and design. Many of us have porches that need just a little bit of bling, and a basket of fragrant, flowering herbs is just the thing. Hanging baskets also make great privacy on your porch, if they are strategically placed and planted with flowing type herbs. There are some tips to know, to be certain your herb hanging baskets stay lovely all season long. Think about it; your hanging basket may seem out of the way when you visualize it gently swaying off the edge of your deck, but you will need to keep it accessible at all times. Even the best planted herbal baskets need constant monitoring and watering. Always plant them where you can comfortably reach on a regular basis. Using a hook with a retractable cord on it, will make pulling down and raising the baskets a snap. When you think 'hanging basket', you probably think 'sunny location'. This is not always the case. There are many herbs that grow very well with little sun. This is a blessing for those of us with corner areas that seem to stay shaded, no matter what time of day. When you are designing herbal hanging baskets, don't forget this often overlooked areas, and pot up something that will thrive! Once they are potted and hanging in plain view, it is easy to forget that your baskets need extra care. They are exposed on all sides by airflow, meaning that evaporation is at its highest. They are often out in the full sunlight, requiring more watering than even a container pot on the same porch. Check your hanging baskets first thing in the morning, and last thing at night for watering needs. Unless you have your hanging baskets on a pole, they are only getting sunlight on one side at a time. Rotate your baskets every few days, to keep all sides looking their best. I find that the 3-day rule also applies here. Don't forget to prune! 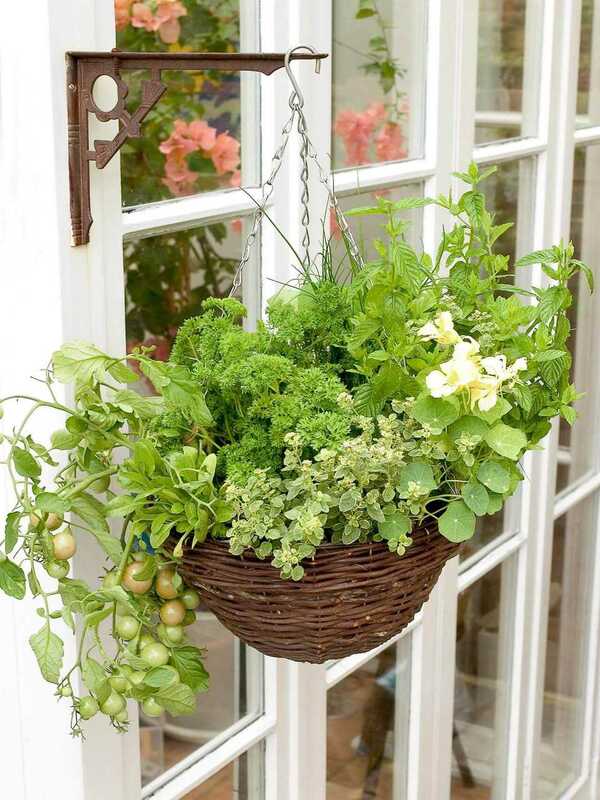 Your herbs may be the showcase element for your porch, but they are still available for you to enjoy as well. Pruning and using your herbs will keep them from becoming leggy and thin looking. It may sound strange, but to keep your baskets looking lush and full, trim them back regularly.